This disc is the last instalment of a series of eight documenting the emergence and the disappearance of the trio sonata, one of the main genres of instrumental music in the baroque era. It was dominated by counterpoint, and therefore its demise around the mid-18th century was the logical consequence of the shift from counterpoint to melody as the foundation of music. This disc focuses on German music of the 18th century. The earliest piece is the Sonata in G by Georg Philipp Telemann. It is assumed that it was written in 1708. Its scoring for violin, viola da gamba and bc reflects the German tradition of composing music for this combination. In the 17th century large numbers of sonatas for violin and viola da gamba were written, more than anywhere else. In Italy, for instance, trio sonatas were almost always composed for two treble instruments - mostly violins - and basso continuo. The programme opens with one of the best-known trio sonatas of the German baroque, theSonata in C by Johann Gottlieb Goldberg. It is a classical specimen of the German contrapuntal tradition which found its zenith in the oeuvre of Johann Sebastian Bach. It is not surprising that this sonata was once considered a composition by Bach himself and included in the catalogue of his works. Goldberg was one of Bach's students and a quite brilliant one at that, who was especially skilled in playing the keyboard. Johann Friedrich Fasch was one of the most respected composers of his time. No wonder he was taken into account as a possible successor to Johann Kuhnau as Thomaskantor in Leipzig. He worked for most of his life in Zerbst, but had many contacts throughout Germany. A considerable number of his works have been preserved in the archive of the court chapel in Dresden, which bears witness to his status. The Trio sonata in c minor is still dominated by counterpoint and the two violins are treated more or less equally. The third movement, a largo, is especially noteworthy. The Trio sonata in F by Johann Christoph Friedrich Bach shows the change in the texture and character of the trio sonata. The classical trio sonata had four movements, largely following the model of Corelli's sonate da chiesa, but towards the middle of the 18th century composers started to write sonatas in three movements, adopting the form of the modern Italian solo concerto. This sonata also is in three movements and ends with a minuet, another modern element. The minuet was to become one of the most popular forms of chamber music - especially in repertoire for amateurs - in the second half of the 18th century. In this sonata we often hear the two violins play in parallel motion which is also a feature of 'modern' music in the 18th century. Johann Gottlieb Graun was for many years a member of the court chapel of Frederick the Great. He entered his service when Frederick was still Crown Prince of Prussia and set up his own chapel. He then became a key figure in the chapel when it moved to Berlin after Frederick became King of Prussia. He wrote a large number of instrumental works, although it is not always clear in each case whether he or his brother Carl Heinrich is the author. The scoring of the Trio in B flat is remarkable. The viola didn't play an important role in the chamber music of the baroque. If it was used it was mostly in the ensemble music of the 17th century in Germany. Around the middle of the 18th century some composers wrote sonatas with alternative parts for the viola or the viola da gamba. As the latter instrument was increasingly moved into the sidelines, the viola was a good alternative. It is interesting that in this particular sonata the viola starts the proceedings in every movement. The first ends with a short cadenza for the two instruments. This sonata is again in three movements, and here we find the order which would become the standard in the third quarter of the century: slow - fast - fast. The programme ends with the Trio sonata in B flat by Carl Philipp Emanuel Bach. It is from a collection printed in 1763. One gets the impression at first that this is an example of the classical trio sonata as both instruments are treated on an equal footing. However, the frequent passages in parallel motion show its modern character as does the fact that in the middle movement (largo) the violins play with mutes, a frequent practice at the time. In this movement we also find various passages in which the violins play pizzicato. Looking back at this series one could say that the trio sonata in its original form survived longer in Germany than in, for instance, Italy. That has everything to do with the preference for counterpoint which was stronger in Germany than elsewhere. One of the features of German music of the mid-18th century is the coexistence of traditional and modern music, sometimes in the oeuvre of one composer, such as Telemann or Wilhelm Friedemann Bach. 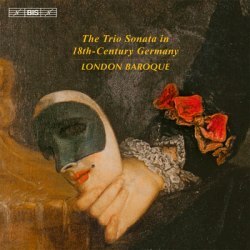 This disc documents the shifts in the way the genre of the trio sonata was treated. Other discs in this series included a number of compositions which had not been recorded before. I don't know whether every piece on this disc is already available on disc. I suspect that the pieces by Fasch and Graun could be new to the catalogue. Even so, with the exception of Goldberg's sonata these compositions are not that well-known and that makes this disc a worthwhile addition to the discography. That is even more the case in consideration of the performances. London Baroque is one of the older ensembles in the world of historical performance practice. It is still going strong, and it is remarkable how it has kept its high standard over so many years. That also applies to the Bis trio sonatas series: eight discs, intelligently put together and forming a lively documentation of an important part of music history. The playing is again of the highest quality. It is just a shame that this disc is the last in this project. What's next?